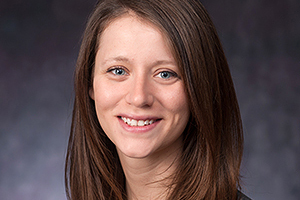 School of Public Affairs Ph.D. candidate Katie Vinopal has been selected as a 2015 NASPAA Emerging Scholar. The annual award from the Network of Schools, Public Policy, Affairs and Administration (NASPAA) recognizes the outstanding work of doctoral candidates who will be seeking an academic position in the 2015-16 school year. Vinopal, selected for the Staats Emerging Scholar honor, will present a paper at NASPAA’s annual conference in Brooklyn, N.Y., on Oct. 15. National and international public service education leaders who make hiring decisions will be in the audience. Vinopal, a doctoral candidate in the Department of Public Administration and Policy, said she was “excited and honored to be selected” for the award and was and looking forward to presenting her work at the NASPAA gathering.